This nine 1/2 month project that I’ve been working on is finally done. Her name is Baby Sophia Rose and she was born on 11/16. She is the sweetest little girl ever! I’m in love 🙂 This is me and her the 2nd day after her birth. She’s wearing the baby ruffle hat that I made with knit picks sock yarn. I got the pattern from Little Sesame Knits. I improvised a little to add some color transitions and add a green stem at the top so that it looks like a flower cap. I also finished the baby cashmere blanket that I’ve been working on. It is to die for, soft as a cloud! It’s made out of Artyarns sock yarn with size 9 needles. I cast on 100 and knit every row. 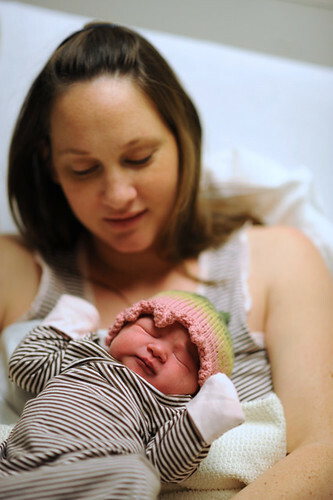 I’ve been doing very little knitting and no blogging in my last few months of pregnancy. My hands have been busy either shoving food in my face (no joke! ), or typing frantically on my computer trying to wrap up the last few things at work to get ready for 3 months off. PHEW, I made it, today is the first day of my maternity leave and I have 13 more days until my due date! I’m working on a little hat and a little blanket. It’s slow going because I can’t find the comfort or energy to go for very long, but now that I’m off of work, maybe I’ll get a few days of knitting in before she arrives! The yarn above is from ArtyYarns, called Cashmere Sock. It is soooooooo soft! 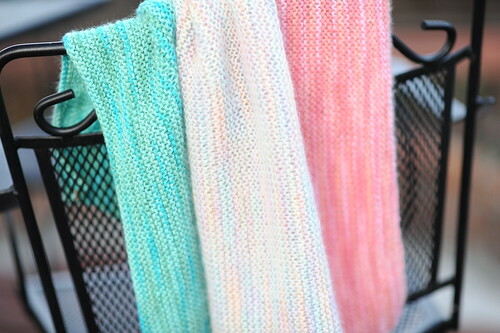 I’m making a simple garter stitch blanket for the carseat. 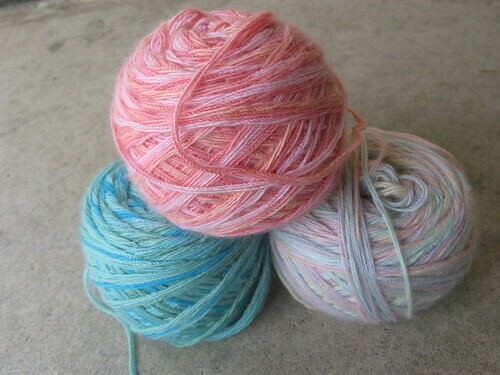 I’m nearly through the pink skein already. It’s so light and soft like a cloud. I’m using size 9 needles even though it is sock weight yarn because it’s a nice fluffy yarn that fills up the holes nicely. Oh – and it’s supposedly superwash! Will I wash it?? Ummm, no 🙂 Only the gentleness of hand washing care for this little blanket.